Happy Mobile Prive is one of the firsts offering of the new local smartphone outfit. The local company believes in delivering quality and remarkable devices that are good for the budget. We have previously checked the Happy Mobile Oracle before, now its Prive’s turn to steal some lightning. The Prive boasts 5.5-inch HD display with One Glass Solution which makes the panel a tad thinner and responsive for our quick touch-tests. It runs on a MediaTek octa-core processor with a beefy 2GB of RAM. The Android KitKat will run the whole show for a nice and seamless performance while the 3200mAh battery will keep the hardware intact for a day of intensive usage. Camera-wise, you will have a 13-MP camera rear shooter and an 8-MP front snapper to give you nice quality captures for your mobile photography needs. The Prive packs a 16GB of internal memory but just in case you need some space, the phone has a microSD support to give you up to 32GB of memory. This feature set makes Prive one of the best local phones in the mid-ranged category. In fact it aligns itself to the higher mid-tier devices of Samsung and LG. In fact, as the brand’s premier phone, it is equipped with fingerprint sensor which makes it the first local handset to have this noteworthy feature that is normally attributed to international flagships. With Miracast, you will be able to easily transfer audio and video files to or from your device; you can also screencast videos from your phone to other larger screens your TV, PC and laptop via WiFi Direct connections. The phone will also have USB-OTG, which allows you to connect other devices for charging and even file transfer purposes. Other specs include 3G connectivity for mobile internet, dual-microSIM, WiFi, Bluetooth, FM Radio and more. 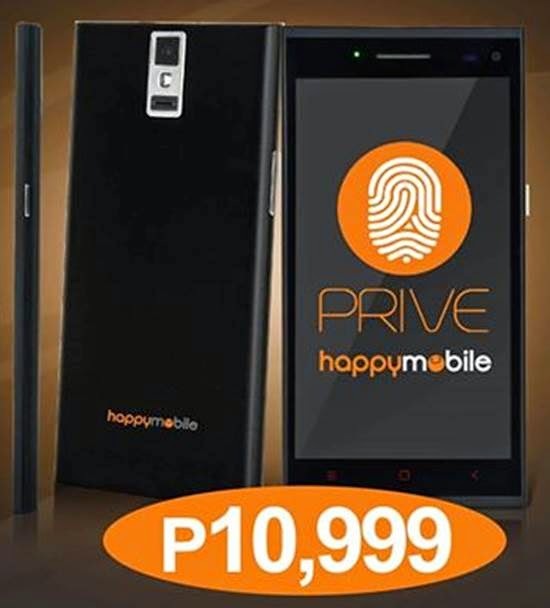 Happy Mobile Prive is now available in Happy Mobile Kiosks and authorized resellers.